Lib Dem activists this week face the harsh reality their party is now an active supporter of the Tory’s neo-liberal NHS reforms, writes Trevor Cheeseman. Lib Dem activists this week face the harsh reality their party is now an active supporter of the Tory’s neo-liberal NHS reforms. Just four out of 57 Lib Dem MPs voted against the Health and Social Care Bill’s recent Third Reading (with up to 10 abstaining) – many less than rebelled over tuition fees. Six months ago it looked so different. At their Sheffield Spring conference, Lib Dem activists protested against their MPs’ united front with the Lansley reforms, given a “no top down reorganisation” pledge on the NHS in the Coalition Agreement. A motion opposing the reforms, and supposedly binding on party MPs, was passed overwhelmingly. Immediately afterwards, rebellion spokesman Evan Harris set out their demands. • Redefining of the role of Monitor, the regulator of NHS Foundation Trusts, as economic regulator: A duty to ‘promote competition’ has now changed to ‘prevent anti-competitive practice’. Even Andrew Lansley must have smiled at that one. • Statutory safeguards to prevent, through cherry-picking of straightforward patients and/or profitable procedures, the undermining or fragmentation of remaining NHS services, finances, research and training: Though price competition will be outlawed, some lawyers are arguing that this is meaningless and will be overruled in the courts by EU competition and procurement law. The coalition’s Any Qualified Provider policy, opening up individual service to a wider market, begins in 2012. 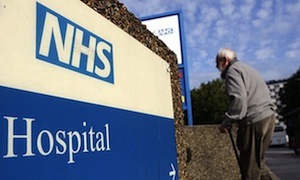 There will be “genuine opportunities” for the private sector to take over large chunks of the NHS, health minster Earl Howe let slip recently, while e-mails show how NHS officials are seeking to involve German healthcare firms in running so-called “failing” hospital trusts. In addition, the duty of the Secretary of State for Health to secure and provide a comprehensive health service – essentially, the original duty of the Secretary of State – has not been reinstated in full in the revised bill. Campaigners 38 degrees have sought legal advice that shows the risks attached to the Coalition’s “hands-off clause”, moving the responsibility for the provision of health services from the health secretary to unelected commissioners. Shirley Williams also weighed in over the summer. Yet she too was quietly ignored by MPs, and especially Nick Clegg – who played a clever game over the summer of angry rhetoric on the reforms but was content with a very mild set of changes. Before he became party leader, Clegg was openly talking about the need for “the NHS to be broken up”. Except that is what the vast majority of their MPs did ten days ago. Lib Dem activists have been struggling to even secure Conference debating time this week on the NHS reforms, but party bosses have forbidden any consideration or vote on a specific motion regarding the bill, fearful of a repeat of the Spring Conference embarrassment. The bill will face tough opposition on points of detail in the Lords from Opposition and non-aligned peers, as well as some Lib Dems, from next month. There is no doubting the sincerity and consistency in campaigning on the NHS amongst the Lib Dem grassroots. The wider lesson however, seems to be that the Orange-Bookers wield the real power within the Lib Dem Party and Parliamentary hierarchy. As a result, public services such as the NHS face, in Harris’ own words, “excessive and damaging changes” via a strong dose of competition and fragmentation. Sounds like Dr Evan Harris is a taking a very Social Democratic line on the NHS. Didn’t there used to be a party with that name? Perhaps there should be one again.